All praise is for Allah, the Lord of the Worlds, the Cherisher and Sustainer; the One to whom we submit, obey, follow and worship to the exclusion of all else. Peace and Blessings be upon His final messenger Muhammed, the mercy unto mankind, who He sent with the truth and guidance. This short clarification is intended to serve as a basis for understanding the timings for prayers and fasting, especially during the summer time within the United Kingdom. Because prayers are a ritual act, they must be done in a very specific manner at very specific times. There is some flexibility however and some differences of opinion exist within the schools of thought. These differences are enshrined in the books of Islamic fiqh and have roots and supporting evidences. In the early days, the prayer times were determined by visual observation, and later these visual observations were recorded and that served as a foundation for establishing timetables, as an aid to determining the correct times. With the expansion of Islam, we find that Muslims began to reside in countries higher in latitude than the early lands of Islam. In the United Kingdom, Muslims come from all over the world and have established their own centres that cater for their diverse communities. Generally our prayer times in the modern day can be found in timetables, often produced by local mosque committees and issues such as when to start Ramadan, and when to pray Eid have often caused a degree of confusion and disagreement. These are issues which are communal and determined at a community level with the individual having to follow his community. The aim of this paper is not to discuss this issue of moonsighting, whether it should be global or local, possible or not. The aim of this paper is to address an issue which is far more critical, as it relates to an individual obligation irrespective of the local mosque or Islamic centre. This disagreement is centred around the starting time for Fajr because it has great implications for the fasting person. This is because the start of Fajr is also the ending time for suhoor; the last time at which a person is permitted to eat in order for the fast to be valid. It is hoped that the information contained below can assist in shedding light on an issue which can make the difference between the acceptance and rejection of our fasts during the entire month of Ramadan. The times for the daily prayers have been determined by Allah at fixed times, depending upon the position of the sun. The prayers, and the times at which they are to be performed, were taught to the prophet (s) by angel Jibrael. When the sun passed the meridian, he gave the command to Bilal who uttered the call to prayer, and then he commanded him to pronounce the iqamah for noon (Zuhr) prayer. When the sun was high, white and clear he again gave the command and the iqamah for the afternoon (Asr) prayer was called. When the sun had set, he gave the command and the iqamah for the evening (Maghrib) prayer was called. When the twilight had disappeared, he then gave him the command and the iqamah for the night (Esha) prayer was called. When the dawn appeared, he gave him the command and the iqamah for the morning (Fajr) prayer was called. The next day, he commanded him to delay the noon (Zuhr) prayer until the extreme heat had passed and he did so, and he allowed it to be delayed till the extreme heat had passed. When the sun was high, he observed the afternoon (Asr) prayer, delaying it beyond the time he had previously observed it. Before the twilight had vanished, he observed the evening (Maghrib) prayer. When a third of the night had passed, he observed the night (Esha) prayer. When there was clear daylight he observed the dawn (Fajr) prayer. With reference to Fajr prayer in particular we have further emphasis. At what times are the prayers performed? Based upon the statement and actions of the prophet (s) from the narration above, and other similar narrations, the prayer times can be established. There may be some fine differences amongst the standard schools of thought; the Hanafi, Maliki, Shafi’ie and Hanbali, which were established by their respective Imams. The time for Zuhr begins after the sun has passed its highest point. The preferable time for Zuhr is at its earliest time, although there are some views that suggest it is better to delay it if it is too hot, and others say that it is still better to pray even when it is hot. As for the end of Zuhr, Imam Shafi’ie, Imam Malik and Imam Ahmed ibn Hanbal maintain that it is when an object’s shadow is equal to its length. Imam Abu Hanifa held that Zuhr is permitted until the object’s shadow is twice its length. Other Hanafis such as Imam Abu Yusuf and Imam Muhammed, the students of Imam Abu Hanifa, believe that Zuhr is permitted only until the shadow is equal to the object’s length, but Asr is not permitted until the object’s shadow is twice its length. The time for Asr is agreed to start when the shadow of an object is equal to its length, except for one of the views of the Hanafi who said that it is when the shadow of the object is equal to twice its length. Imam Malik did however hold the view that there is a period sufficient to pray four rak’at, that is an overlap between Zuhr and Asr. As for ending time, Imam Shafi’ie stated that once the length of a shadow is twice the length of an object, the preferred time has ended and the permissible time remains. The Hanafi also recommended praying Asr well after the time has entered, but before the sun turns pale, unless it is overcast, in which case Asr should be prayed earlier. The Hanbali held that Asr prayer can be performed up until the sun turns yellow or red. The time for Maghrib begins when the sun sets. Imam Shafi’ie and Imam Malik were of the view that it should be prayed immediately. Imam Abu Hanifa and Imam Ahmed held that it can be prayed until the twilight disappears, although the early time is better. The starting of Esha is with the total disappearance of twilight such that it becomes completely dark. However the disappearance of twilight goes through a phase where first the redness in the sky disappears before the whiteness disappears. Imam Malik and Imam Shafi’ie held that Esha starts when the redness disappears, whereas Imam Abu Hanifa held it to be when the whiteness disappears. Imam Abu Hanifa and Imam Shafi’ie held that the end time is the first third of the night. Imam Shafi’ie again stipulated that after this time, only the permissible time remains, and Imam Malik said similar. A second view from Imam Malik is that it should be prayed before middle of the night. The view of the Hanbalis is that it should be prayed before the middle of the night but if there is a need, it can be prayed up until Fajr time. The time for Fajr begins when the first light of dawn appears and continues until sunrise. The Hanafis hold that it is preferable to pray Fajr nearer to daybreak, whereas Imam Shafi’ie, Imam Malik and Imam Ahmed prefer the starting of Fajr time. These times can be summarised in the diagram below which illustrates the path of the sun in relation to our horizon. Thus the prayer times are not determined by anything other than the movement or position of the sun in relation to where we are. The Muslims of the past were Islamic scholars as well as technological masters and scientists, and lead the world in all spheres of life including astronomy, maths, science, medicine etc. To determine the prayer, someone would check to see when the first light appeared. This sighting or witnessing was called ‘mushahada’. They observed that the first light always occurred when the sun was a set depth below the surface of the horizon. This is what we call in the modern day, the angle of solar depression. 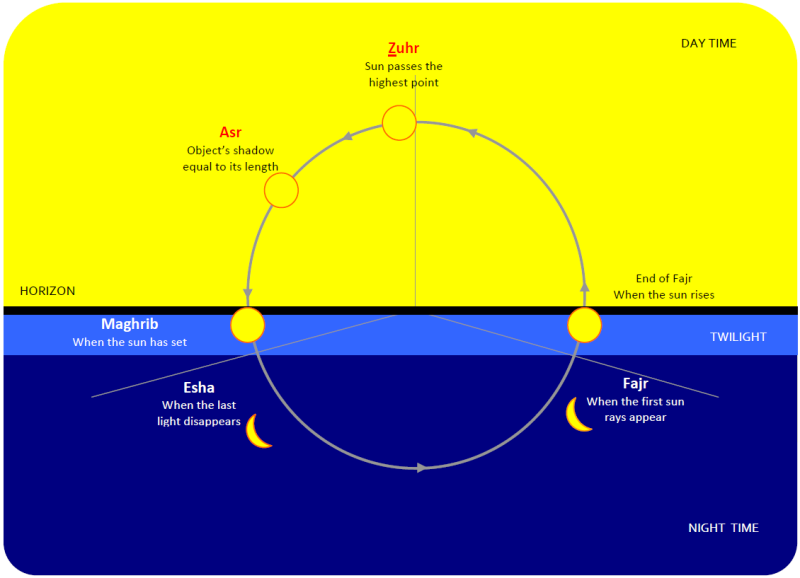 They had calculated that when the sun descended a fixed distance below the horizon, the last light disappeared, resulting in the start of Esha time, and when it had ascended to a fixed length below the horizon the first light appeared resulting in the start of Fajr time. Thus, it was not necessary to go out to observe the sun everyday, as some days may have poor visibility due to excessive cloudiness, rain or other factors. The fixed length gave the angle of solar depression at approximately 180, based upon the regular witnessing (mushahada) of the disappearance of the last light and the appearance of the first light. The earliest records we have are from Islamic scholars such as al Battani (317 H) and al Biruni (440 H) who calculated this angle. Therefore in the modern day, we use timetables based upon this initial witnessing, except we are able to verify this angle through precise scientific instruments. Because the times at which the prayers enter are not conditional upon actual sighting, but rather upon the position of the sun, it is totally permitted and acceptable to use these calculations. If it were necessary to witness the prayer times for each and every prayer, every Muslim would be required to look to the sun to determine the time for prayer, which is clearly not the case. The issue of verification has arisen on numerous occasions historically, and every time, with different authorities, during the various ages, practically the same conclusions have been drawn. 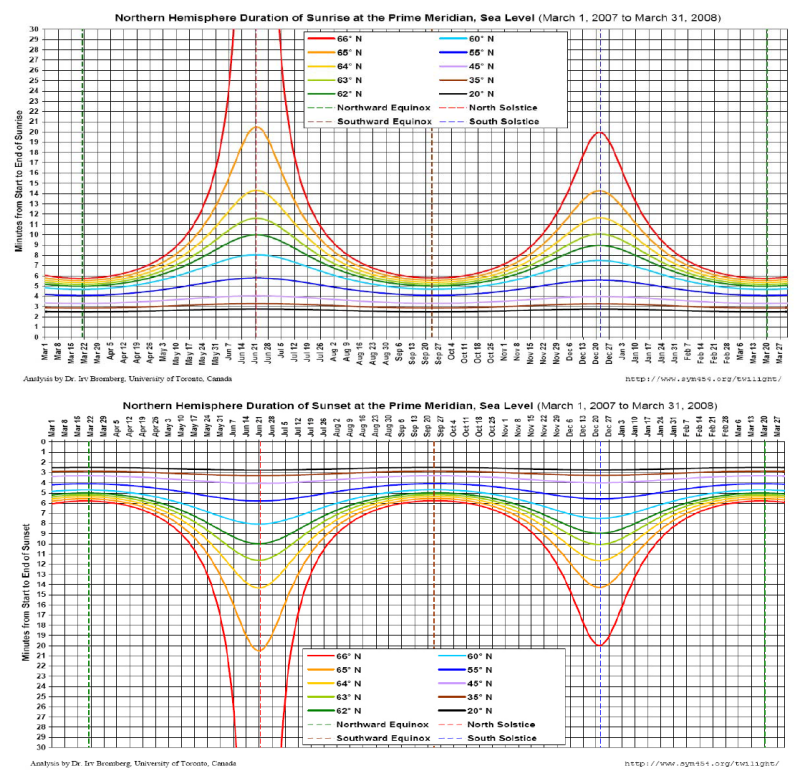 Thus when using a computer program to determine prayer times, there are a various formulae that can be used to calculate the prayer times, with a slight variation on the angle of solar depression. *ISNA moved from 180 to 150, but now have changed to the times shown above. The differences between Fajr and Esha angle are usually due to the different schools of thought in relation to the disappearance of twilight, with some determining the time for Esha to enter when the redness disappears and others when the whiteness disappears. Therefore, every organisation independently calculated the angle of solar depression to be around 170 – 190. In countries with a low latitude, the prayer times can be fairly constant. This means that the length of the day is about the same as the length of the night, both in summer and in winter. In countries such as Equador which lie on the equator, the ration of night to day is about the same. This becomes more pronounced with countries that are positioned at higher latitudes such as Saudi Arabia which has a latitude of between 160 to 330. Therefore the days increase in length during the summer months by a few hours, in relation to the daylight in the winter months as the latitude increases. This means that in the summer time Fajr will be earlier and Esha will be later due to the longer daytime. In the United Kingdom, our Fajr and Esha times seem to get very close during summer. This is because of our geographic location in the world (in the northern hemisphere) of between 490 and 610. This can be exemplified in the movement of the sun in relation to us during various parts of the year. Countries that are above 440-490 latitude in the northern hemisphere tend to suffer from a particular condition during the summer months called persistent twilight. This is because the path of sun is a bit higher so the sun does not actually dip low enough in relation to the horizon for there to be total darkness. Therefore the day/night ratio changes during the year, but in the summer months, in United Kingdom, night as defined by shari’ah does not actually exist. This can be better illustrated in the summer months of a country higher up in the northern hemisphere like Norway which has persistent light from May to July. In countries that have a very high latitude there is 24 hour sunlight, which does not allow for Maghrib, Esha or Fajr according to the positions of the sun, because it does not descend below the horizon. Depending upon the latitude, some countries like Norway have persistent twilight during the summer months meaning that there is constant daylight during the months from May until July without any night time. This is caused by the path of the sun in relation to the horizon. Latitude is essential in understanding the amount of light that is visible when the sun is above the horizon and even when it descends below our horizon. Countries near the equator have even amounts of day and night over all seasons. Countries that have very high latitudes have extreme ratios of day and night depending upon the season, with some countries having sunlight continuously for summer and night time continuously for winter months. Although this is more pronounced in countries that lie high in the Arctic Circle, the phenomena is also shared to a lesser degree by any country that lies above 440 –490 latitude (the exact figure is suggested to be 480 33’). In the United Kingdom, the sun does descend below the horizon, but not sufficiently enough for total darkness, because twilight still persists, so therefore although Maghrib enters, Esha cannot enter, and subsequently, Fajr cannot enter. Twilight is the light that remains in the sky when the sun has set or not yet risen. 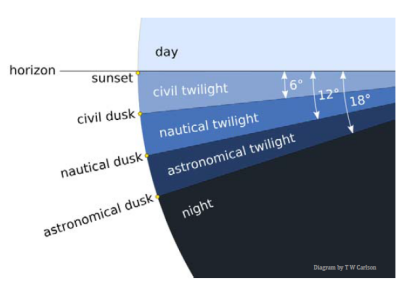 There are three scientific classifications of twilight. The first is when the sun has just set, but there is still light visible, and this is called civil twilight. This occurs from the time the sun dips below the horizon until it is 60 below it. The next phase occurs when the sun is between 60 to 120 below the horizon and is referred to as nautical twilight. During this time, there is still some light visible, but not much, so although nearby things can be sighted, the horizon can not be seen. The last phase occurs when the last rays disappear and this is referred to as astronomical twilight, this is said to occur starting from 120 until total darkness when the sun is at 180 below the horizon. The only twilight that is significant to the Muslims for prayer, is the one at which the last light disappears and the first light appears – This is astronomical twilight at its maximum, represented in the diagram as astronomical dusk. Therefore, scientifically, the last light disappears at approximately 180, and the first light occurs at 180, confirming what the Muslim scientists established many hundreds of years ago. The prayer times in the United Kingdom must still follow the same general rules as established through shari’ah. However, there are a couple of extra issues that must be contended with. The first issue is that of light pollution. Due to the United Kingdom being a very industrialised area that is densely populated, it is extremely difficult to note the end of twilight and the first light of dawn. This is due to the constant refraction of artificial light, especially in built up areas. It is therefore not uncommon to still have some degree of light even when the prayer time for Esha enters. To eliminate the implications of artificial light, it would be necessary to leave those areas where artificial light can pollute the purity of natural twilight, such as in urban area, or where the line of sight transcends above lit areas. This would theoretically occur on the east coast. The second issue is that of persistent twilight. Because the United Kingdom has a latitude of over 440-490, it is evident that during the summer months, true darkness does not actually happen. Therefore the causing factors for Esha and Fajr do not occur, which means that Esha time and Fajr time do not technically enter. This is the same phenomena, but to a lesser degree, than that which occurs in the Arctic countries called midnight sun or polar night resulting in persistent twilight. Islam however has a solution for all problems and persistent twilight is, of course, something that is included in the Islamic Laws. When persistent twilight occurs, as illustrated above, Esha does not enter, so Fajr time does not enter either. So how can Muslims pray? This was explained by the prophet (peace and blessings of Allah be upon him) when he mentioned a hadith about Dajjaal and the length of the day. Therefore if the day does not follow the norm, we are permitted to calculate. There are various times put forward for calculating the prayer times. Some classical scholars such as Imam Nawawi mentioned some, and in totality we have a variety of methods that have been used. This method is to pray Maghrib after sunset, Esha at the last time that Esha entered at, and Fajr at the last time Fajr started at until sunrise. This is based upon the principle of presumption of continuity, in that the last known command is followed until there is a reason to change. This method requires the following of the nearest city at which the phenomena is not occurring. This is based upon drawing an analogy with the nearest city longitudinally that has natural day and night. This would mean any major city between 440-490 where the phenomena does not occur. This method involves splitting the night into halves. Maghrib is prayed on time, and the Esha is prayed before half of the night, and the second half of the night is for Fajr. This is based upon dividing the night into two sections for the two prayers for which the times do not enter. This is based upon the narrations in which the prophet (s) would divide the night up into three sections and would pray Fajr in the last part of the night. The early part would be left for Maghrib which would then leave the middle part for Esha. This method splits the night into seven parts, with the first for Maghrib, the last for Fajr and the five remaining parts for Esha. Another method is to follow the initial land of Islam, Makkah, and the timings that are used there. This is the method that has been used in the northern most mosque of the world in Norway, where they suffer from 24 hour day during the summer months. This method allows the combining of Maghrib and Esha, and the prayer of Fajr nearer sunrise. This is based upon the principle of combining the prayers due to hardship, but praying Fajr at the time that it would usually enter. All of the above methods have been put forward by scholars as means of calculating as per the hadith of the prophet (peace and blessings of Allah be upon him), but only when the day is irregular, and not at any other time. Just before the phenomena of persistent twilight, there may be a time when the day is very long, and so there may be a very short time between Maghrib and Fajr. Although the hadith of Nawwas ibn Saman about the Dajjaal mentioned earlier talked about a day in which the prayer times did not enter, what about the times where the day is so long so as that Esha is very close to Fajr? There are four views regarding this. The first view simply states that the prayers must be on time, because Allah has fixed the prayers at particular times, and as the times are still entering, each prayer must still be performed at its respective time. This may mean that the time frame between the entrance of Esha and the entrance of Fajr may be very short. This view takes the concession granted by the prophet (peace and blessings of Allah be upon him) to join Maghrib and Esha together in times of hardship, but as Fajr is not joined with any prayer, it must be prayed within its correct time. This view also takes the concession granted by the prophet (peace and blessings of Allah be upon him) to join Maghrib and Esha together, with Fajr prayed on time, but leaves a gap between Maghrib and Esha to ensure the prayers are said five times in a day. This view, supported by Umm ul Qura University, again uses the same principle, but allows the praying of Esha 90-120 mins after Maghrib. Although the starting of Fajr is not normally a serious issue, because Fajr can be prayed anytime from the beginning of the time until sunrise, it becomes a major issue for fasting. This is because suhoor begins at the starting time of Fajr. Abdullah Ibn Abbas narrated that the Messenger of Allah (peace be upon him) said, “Gabriel (peace be upon him) led me in prayer at the House (i.e. the Ka’bah). He prayed the noon (Zuhr) prayer with me when the sun had passed the meridian to the extent of the thong of a sandal; he prayed the afternoon (Asr) prayer with me when the shadow of everything was as long as itself; he prayed the sunset (Maghrib) prayer with me when one who is fasting breaks the fast; he prayed the night (Esha) prayer with me when the twilight had ended; and he prayed the dawn (Fajr) prayer with me when food and drink become forbidden to one who is keeping the fast. The verses of the Qur’an also stipulate the determination of the first lights in the horizon as the distinguishing factor, prohibiting eating and drinking from that point. This would be when it is still very dark. It must also be noted that before true dawn there exists a false dawn, where light is visible as a vertical column. This does not prevent eating and therefore does not mean the start of Fajr. The first light of true dawn is when the light spreads horizontally. It stands to reason therefore, that the issue of the starting of Fajr becomes a major issue during the month of Ramadan, because if the starting time is during persistent twilight, then how are we supposed to fast? Some people have correctly asserted that it is recommended to eat until one is certain that the time for Fajr has entered. The recommendation however is only up until Fajr, and eating once Fajr has started is prohibited. This is because the entering of the time of Fajr is clearly stipulated as the time of the first true dawn, and if one were to eat after that, then the fast is invalid. It is a responsibility upon us to worship Allah in the manner He has requested, and He has stipulated the time of eating only up until the start of Fajr. Should we then continue eating without checking the times, then truly this is a transgression of the intended command. As for the time for the congregational Fajr, then it can be prayed at the beginning or end of Fajr time. There is a minor disagreement regarding the preferred time to pray the congregational Fajr prayer. The Hanafi consider it better nearer to sunrise, whereas the other schools prefer it closer to the time of the starting of Fajr. The flexibility therefore exists to pray Fajr earlier, especially as the last time of eating (suhoor) is at the start of Fajr time. Is there a Need to Re-evaluate these Times? As has already been discussed, the times of the prayers have been universally agreed upon by consensus of the Muslims, both laymen and scholars for over a thousand years, with the formula of the angle of solar depression at about 180 below the horizon. In countries where persistent twilight (or midnight sun) occurs, there have been a range of practices that have been used. Some organisations in the northernmost mosques (Tromsø, Norway) follow the times in Makkah. In the United Kingdom, the phenomena is less pronounced, and the issue of the entering of Fajr time is not a serious issue, as Fajr can still be prayed closer to sunrise, but this issue gains immense importance when Ramadan nears the summer months. Historically, the default method adopted by the vast majority of mosques within the United Kingdom, was based upon the formula of 180. For the period in which there was persistent twilight, the method of following the nearest city (closest longitudinally) in which the phenomena did not occur was Avignon, France (430 57’). The most recent time when this issue of fasting in Ramadan during the summer months arose, was in the late 1970s which prompted much discussion at the Islamic Cultural Centre in London (Regents Park Mosque). Since then, there have been various meetings in the United Kingdom and other countries throughout the world to address the issue, and almost unanimously the conclusion resolved to follow the same principle of approximately 180. Because the Islamic calendar is a lunar one, the month of Ramadan does not stay constant during the seasons. In relation to the solar calendar, it changes by about ten days annually so every thirty or so years, it comes back to the same place. The season which causes greatest anxiety is summer, as the days are long and we have the issue of persistent twilight in the Northern hemisphere. Thus it is the usual time that this issue is revisited and this was the case very recently. Up until Ramadan in 2011, The Islamic Cultural Centre (Regents Park Mosque) had been following the timetable based on 180, and indeed had hosted and participated in numerous conferences in the past to discuss prayer timings, all of which had yielded a conclusion that 180 was indeed the correct methodology. In order to achieve this and prepare for the forthcoming summer Ramadan, many meetings were undertaken, mainly with the major mosques within London. Meetings discussed the various options. These included the methodology of following the nearest city which does not suffer from persistent twilight (in this case Avignon), the timings for 180, the timings for 150, the timings from the Blackburn sightings, as well as a couple of other alternatives. After much deliberation, and having agreed that 180 was the most aptly suited option, there was a final meeting just weeks before Ramadan. In this particular meeting, it was decided that rather than the previously agreed methods, the timings from the Blackburn sightings would be accepted for the moment, subject to an impending conference on this topic in Saudi Arabia, and also subject to verification of the times. Hence, a ‘New Unified Timetable’ which was supposedly based on the Blackburn sightings was endorsed by ICC UK, a few other masaajid and representational bodies that attended the meeting, including the London Muslim Forum and the West London Mosques Forum. Official announcements were made, and statements were made to the Muslim community. Mainstream Islamic television channels were also informed in order to conform to the new timetable, although in the early part of the month, this caused much confusion. Thus, in addition to the usual standard protocol that has been historically followed, we now have two new theories that are being used in the United Kingdom. The first is the ‘New Unified Timetable’ and the second is the theory that the start of Fajr should be about 90 – 120 minutes before sunrise. We shall discuss both of these and assess their validity. The unification is not an unconditional unification, but rather one that holds onto the command of Allah in the most correct manner. In 1988 a group of ulema and learned individuals decided to check the times for prayer in the United Kingdom. Based in Blackburn, they went out to witness the twilight. This witnessing (mushahada) was carried out by a group from Hizbul Ulema. They then presented their findings to Khalid Shaukat who runs a moonsighting website. According to him, their findings were correlated by many people who witnessed the beginning of twilight in places with higher latitudes in the US. The theory proposed by Khalid Shaukat suggested that for higher latitudes, it was not correct to use a fixed degree for solar depression. Using computational formulae, Khalid Shaukat devised a timetable that does away with the issue of persistent twilight and long days and varies between 150 in the winter to 120 in the summer. As soon as the timetable was announced, respected scholars started to raise objections. The first and foremost glaring error on this timetable is that it totally ignores the issue of persistent twilight. The fact that this phenomena of persistent twilight above 480 33’ latitude happens is not disputed, and therefore for the whole of the UK, including London, between May and July, there is persistent twilight. Once it is understood that persistent twilight exists, then whilst we near the times of persistent twilight, the duration between Esha and Fajr continue to get closer and closer until the plateau of persistent twilight occurs. The witnessing of the start of Fajr has been scrutinised by other respected ulema who have noticed major inconsistencies. The first and most obvious error is that the sighting was done in an area of high light pollution, which means that a dim light would have taken longer to ascertain. This would mean that the first light would have been missed, and only realised when the brightness of it was sufficient to be noticed. Secondly, it is also now known that the people conducting the witnessing were not fully acquainted with the requirements of witnessing, such as the distinction between the true dawn and the false dawn, or the specific location in which the sun rises due to the Earth’s tilt. Furthermore, there were only 21 successful observations made for the year with the rest being calculated, and in almost all cases, the actual sightings were discarded in favour of calculations. Conversely, some sightings conducted away from light pollution, on the east coast of United Kingdom by others, confirmed the angle for 180 was still correct. It should also be noted that the ‘New Unified Timetable’ is not the timings of mushahada, but rather a computational curve fluctuating between 150 in the winter to 120 in the summer. This is reflected in the timetables produced by mosques which calculate the times according to formulae. Because of this computational method, the start time for Fajr is altered, which essentially means that people may be eating whilst they should be fasting. Some people have suggested that there is a fixed constant time between Fajr and sunrise. Some even base this upon the ‘mushahada’ done is some parts of the Muslim world. They noted the time difference between first light and actual sunrise, and noted that at most it occurred after 120 minutes, and the quickest was 90 minutes. Therefore they logically assumed that the results from this witnessing can be applied in the United Kingdom, with the maximum time of starting of Fajr 120 minutes before sunrise. In support of their view, they posited that Fajr at 180 is too dark and therefore must be incorrect. This view is then assumed to be corrected by the logical conclusion that the time for Fajr cannot possibly be longer than two hours. Textual evidence is provided to supplement the claim. During the time of the prophet (s), there used to be two calls for the Fajr prayer. The first call was one in which the time for Fajr did not begin, and it was not prohibited to eat and drink. This can be explained by the concept of false dawn (subh kaazhib) which a light may sometimes appear as a vertical column before true dawn (subh saadiq). True dawn occurs when the light spreads horizontally. Those who follow the traditional timetables based upon 180 have the start of Fajr at an earlier time, and in some cases may be almost four hours before sunrise. It is thus assumed that they are mistaken because they are following the false dawn. It is concluded therefore that the true dawn would be later, around two hours before sunrise. This methodology is completely flawed because it is entirely based upon incorrect assumptions. Evidently, those who have proposed this may not be accustomed to witnessing the times of dawn throughout the year, and have based their conclusions upon rudimentary sightings during Ramadan. Darkness is a subjective assessment. For those who claim that early morning in the summer months is too dark are mistaken on a few accounts. Firstly, in the United Kingdom, it is very rarely actually dark due to the light pollution over the entire land. True darkness may be seen only in rural areas that are away from bright lights and even that may suffer from light pollution from neighbouring areas. Secondly, because during the summer months, there is persistent twilight, the darkness is still not total, as required by shari’ah. Thirdly, the darkness would depend upon the lunar cycle, with more light visible during the middle of the month with a full moon, rather than at the ends of the month when the new moon is born. Fourthly and finally, from a textual point of view, even if it is dark, that is not the criteria that is used as the companions used to pray in such darkness that they could not recognise each other. It is also pertinent to note that they are departing after the Fajr prayers and not arriving for the prayer and Fajr prayer is one in which the recitation would be long. As for the claim that the earlier time represents the false dawn, this is entirely based upon speculative reasoning without any actual visible verification. Before the break of dawn, there may sometimes occur a short dull light which extends vertically for a short while before disappearing resulting in darkness again. The pattern of light has been described like the tail of the fox. This is what is referred to as the false dawn (subh kaazhib). The true dawn (subh saadiq) occurs after this and can be differentiated because the light extends horizontally across the horizon. As for the two calls for prayer, it is predominantly understood that the first call was for preparation and the second call was to signify the ending of suhoor and thus the starting of Fajr. Thus the true dawn of 180, is horizontal (subh saadiq) and not based on the false dawn, which is sighted as a vertical column. The time taken for the sun to rise and set are not the same all over the world. A simple cursory glance at any timetable from areas away from the equator will illustrate that the time for Fajr to start entering is not constant in relation to sunrise. This is because sunrise and sunset is dependant upon the latitude of the country, with countries further away from the equator, such as those high in northern hemisphere, and those lower in the southern hemisphere experience longer sunrises and sunsets, and therefore longer twilights. This can be illustrated in the following diagram. This is further complicated with the fact that the sun rises from different parts between the Tropics of Cancer and Capricorn corresponding to the different season, which are caused by the tilt in the Earth’s axis. To therefore draw analogies between different months of the year, assumes that the length of sunrise is constant, yet in reality it increases exponentially. Therefore mushahada done in equatorial countries may have more consistent durations of sunrise and sunset, and corresponding twilights, but certainly countries that lie within the northern hemisphere can not use the same principle. To further emphasize this, the sunrise in countries in the northern hemisphere may take days or months, as countries at the poles can have a day lasting six months, and a night lasting six months. The graphs above map the actual time taken for the sun to rise and set in the northern hemisphere. In countries above 660 latitude, the sunset and sunrise do not take place, resulting in 24 hour daylight. Until that time the sunset and sunrise takes longer and longer, with the curve being exponential, rather than a regular constant. As a brief overview we must understand that Allah has determined the times in which we pray and fast. These times are subject to the position of the sun in relation to us. The appearance of the first light signifies the end of suhoor and the start of Fajr. This has been noted to be when the sun is about 180 below the horizon, and this formula has been used the world over, for many centuries. In the United Kingdom, we suffer from a situation in which the sun does not descend sufficiently below our horizon to eliminate all of the light, which is termed persistent twilight. To cater for this, there are various methods that can be used to calculate prayer times. This was the situation until 2011, after which many main mosques and media outlets agreed to adopt a new method of determining the times for suhoor and Fajr. For the ruling to change, it must be because either the Islamic Law has been changed, or the reality has changed. We know that Islamic Law cannot change because Allah has completed His favour upon us and completed the deen for us. Nor does the interpretation change without an external factor, because the methodology of interpreting Islamic law is by referring to the other sources of Islamic law, such as the Sunnah or the explanation and agreement of the companions and the explanations of the earliest scholars of Islam. Any new interpretation after that cannot be accepted, unless it is due to a change in the situation upon which the rulings apply. Therefore it can only be the reality that changes. Some issues have been raised which merit further research. These issues include the suggestion that the elliptical shape of the earth may cause countries in the northern or southern hemispheres to have different angles of solar depression. This could be caused by the way light is diffracted around the resulting curvature of the earth. Another theory suggests that due to the further distance from the sun, the denser atmosphere may not diffract the light sufficiently. As yet, these are all theories and possibilities and it has not been shown that our reality is any different. Thus until it is conclusively shown as such, there is no cause for the Islamic ruling to change. However, the hardship is not circumvented by changing the command of Allah, but rather, Allah gives concessions to those who are ill or sick and unable to fast, and absolves them from fasting. The rules and regulations for this are abundantly explained in the Islamic texts and are not left for people to violate. Were it the case that we can change whatever laws we wish, surely it would be easier, to bring Fajr to a convenient time when we wake up, or even reduce the five daily prayers to maybe one, or even less…. Thus, a realm of ease is permitted, but within the boundaries set by Allah only, and Allah has not given permission for mankind to change His Law. Indeed, it was this very reason of people changing the laws, that Allah sent prophets one after the other, and condemned the people of before who changed the Law of Allah to suit their own needs. Why is the ‘New Unified Timetable’ so widely used if it has so many errors? Many of the mosques and Islamic centres have taken the timings issued by the Islamic Cultural Centre in good faith, hoping and expecting that these were based on substantial evidence. It is also pertinent to note that the International Conference, upon which the decision of the Islamic Cultural Centre rested, did not reach any new conclusions and therefore still accepts the original viewpoint of 180, and neither was any mushahada conducted and reported back to verify the times. These were the conditions stipulated to change the timetable agreed at the meeting at the Islamic Cultural Centre in July 2011. It is the duty of the mosque committees and Imams to thoroughly check the timings they are issuing and advise their congregations to follow in order to absolve themselves of blame on the Day of Accountability. It must also be understood that when there is a difference of opinion, the opinion that should be followed is not one that is based upon convenience, but rather the opinion that should be followed is one that is closer to the intended command of Allah. This is assuming that the opinion is valid, because it must be borne in mind that not every opinion is a valid opinion. The fact remains that Muslims of all schools of thought, throughout the ages, from the various parts of the Muslim world have been content with the angles of about 180. This has been checked from time to time, most recently in various meetings in the last couple of decades. In practical terms, the issue is not greatly significant in that the difference may only be that the start of Fajr is at most about 90 minutes earlier. When it is considered that these 90 minutes may potentially be the difference between a fast being accepted and rejected then surely it would seem logical to err on the side of caution. This issue is a very personal issue and is not dependent upon the community or any other person; rather it is centred around a personal obligation upon which each one of us will be accountable for. It is not sufficient to ‘follow others’ because they are doing it, rather we must follow the command of Allah alone. Verily Allah has fixed the times for our worship. Our fasting and praying is for Him, offered in the manner that He has commanded. We pray that Allah accepts our prayers and fasting, and we pray that He guides us all.